Northwest sophomore Haidyn Wamsley will be a big factor in the Mohawks sectional semifinal contest with Ironton Wednesday evening. Put simply, the Senators (3-18) have a tall task standing in front of them. Lynchburg-Clay (18-3) brings Peyton Scott, a Miami (OH) commit to the table and, frankly, she’s one of the best talents southern Ohio has seen in quite some time. Stopping her from putting the ball in the bucket is much easier said than done. Scott is the Mustangs’ all-time leading scorer and comes into the contest averaging 26.5 points, 11.3 rebounds, 5.6 assists and 4.1 steals per game. Those numbers are good by themselves … but when they’re coupled with Zoe Fittro and Logan Binkley’s contributions, well, there’s a reason Lynchburg-Clay is a No. 2 seed. Fittro comes in averaging 15.9 points and 5.1 rebounds while Binkley adds 7.2 points and 6.2 rebounds. The Mustangs’ three losses have come to Eastern Brown, twice, and Goshen. So that’s what the Senators have to deal with. To have a chance at an upset bid, West must play perfect basketball, limiting turnovers and hitting open shots at a high rate. The Senators are inexperienced and new to tournament basketball, but they also have nothing to lose … which makes any team dangerous if they find a hot streak. However, make no bones about it, Lynchburg-Clay is an obvious favorite to win and even thought, by some, to be the favorite to win a district title. Wednesday’s matchup between Valley and Westfall is an intriguing one to say the least. The Mustangs (13-9) finished third in the Scioto Valley Conference with an 8-6 record in league play. They’ll rely on a mix of Marcy Dudgeon, Marissa Mullins, Mahaley Farmer and others to get the job done. Dudgeon is the team’s statistical leader with averages of 12.8 points and 7.1 rebounds per game. Mullins is a deep ball threat, averaging 12.4 points with 56 3-point field goals this season. Farmer does a little bit of everything, scoring 10.1 points per game alongside a team-high 8.5 rebounds. As for Valley (8-13), Bre Call and Karsyn Conaway hope to negate the efforts of the aforementioned Mustangs. Call is a threat from anywhere to score while Conaway specializes in dialing long distance. Those two will be assisted by the likes of Bailee Day, Brooklyn Buckle and Kaity Howard. While Westfall holds the higher seeding, Valley certainly has a chance at a win. However, to do that, the Indians must keep the Mustangs off the glass and limit turnovers. Those two things, alongside the usual scoring from Call and Conaway, make up the recipe for success. Northwest (9-13) comes into their sectional semifinal matchup with Ironton playing arguably their best basketball of the season. 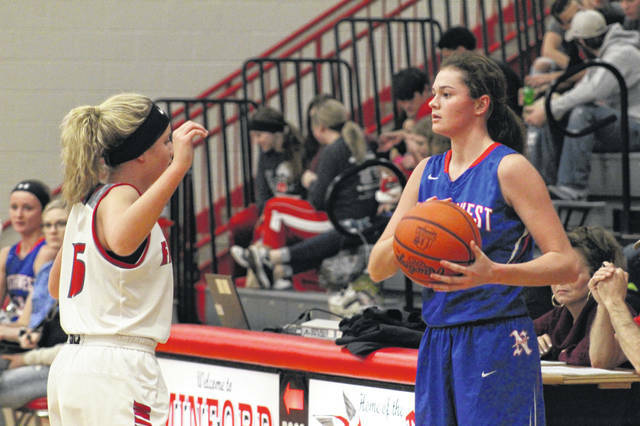 The Mohawks dropped their final two games of conference play against the second and third best teams in the SOC II in Oak Hill and Minford, but prior to those games, Northwest was riding a three game winning streak. Not to mention, the Mohawks held a lead one point lead over Minford on the road on the Falcons senior night last Thursday. Ironton enters their sectional matchup with their most recent win coming over SOC II foe Valley 63-41. Just 14 days ago, Northwest took down the same Indians squad 38-25. For Northwest to pull off the “upset”, they will need to rely on their length defensively, as they have for much of the season, to defend against and Ironton squad that will come at you from the inside and outside. This SOC I sectional matchup pits the Green Bobcats (9-13) against the East Tartans (1-19) in a what will be both teams third time seeing the other as conference rivals. The winner of this contest will advance to the sectional finals where they will meet Peebles. Green freshman Kasey Kimbler and East sophomore Grace Smith will be the two players to keep an eye on in this one. Kimbler has the ability to get to the rim, and also hit the long ball with major success. Smith will be the Tartans dominant ball handler, and her play will be key for her club to get the win over rival Green. For Green to get the win and advance to play Peebles this Saturday in the sectional final, Kimbler and sophomore Kame Sweeney will need to play to their potential as they have in the Bobcats nine win season. As for the Tartans, limiting turnovers and playing solid defense will lead them to earning a sectional semifinal win.